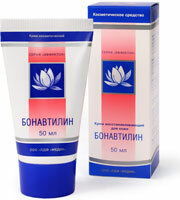 Home » BONAVTILIN Cream for Denas..
Bonavtilin is applied to the skin 10-30 minutes before the DENS-therapy process. Feature of all creams of this series is the presence of eftiderm in their structure. Eftiderm is a through-skin conductor of biologically active substances. It transports components of a medical product through the skin and mucous environments, strengthening their activity. Due to these properties any products made on an eftiderm basis have the highest efficiency. JOINT APPLICATION WITH DEVICES DENS IS RECOMMENDED. Description of working components: Eftiderm - the unique complex, instantly transmits into the skin all active components of a cream, considerably strengthens and prolongs their action. Has anti-inflammatory, antioxidant, citoprotectove, antidropsical and antiallergenic action. Raises viability all of cell structures, stimulates processes of regeneration and local immunity. Malavit - has anti-inflammatory, reparative, anesthetic, powerful antiseptic and antibacterial action. Aloe Vera - promotes processes of regeneration, moisturises and softens the skin; is strong antioxidant. Aralia - adaptogenes. Have antioxidant, tonic, anti-inflammatory, antimicrobial and wound healing action, normalize an exchange of substances, blood supply and work of cell structures of a skin, slow down processes of aging. Oils: jojoba, tea tree, juniper - contain high concentration of the unsaturated fatty acids identical to skin lipids, that raises bioavailability and makes the structure of cream especially soft. Renders anti-inflammatory, anesthetic, antimicrobial, antioxidant and wound healing action, eliminates oedema. Anavenol - venotonic, its action is connected to improvement blood circulation in peripheral vessels. The improvement of venous outflow promotes decrease in joint of pressure causing occurrence of a pain in joints after loading, long walking, pain in first half of night. Extrapon VC - new means containing vitamins A, E and F, dissolved in fatty acids. Chondroitin sulphate - renders anti-inflammatory and analgetic action, is the direct participant in restoration of structure both durability gristle and connecting fabric, prevents degradation of a cartilage. Dalargin strengthens protective properties of a skin, raises local immunity, normalizes metabolic processes. Proteolotical ferments render anti-inflammatory effect. Bonavtilin is effective at: arthritis, artchrosis, including diseases and defeat of joints of a spinal pole (spondiloarthritis, osteochondrosis, Bechterev illness etc.) traumas of the joint-impellent device (crises, stretching ords, sinews, tendovaginites, bursitis); as preventive maintenance progress deformed arthrosis a way of application: the cream is put on area of disturbing joints 1-2 times per day within 10-14 days. If necessary rate can be prolonged up to 1-2 months. It is recommended to combine with DENS, which will result not only in enhancing of cumulative effects, but also will ensure system influence on organism. Bonavtilin is to be kept in a cool dark place (protected from the light).